How do I use the People page in a course as an instructor? People shows all the users enrolled in your course, either added by your or your institution via SIS import. The People page displays all information about the users in your course. The page is designed with global settings at the top of the page  followed by the generated user data . Global settings include searching and filtering by user data. To search for a specific user, type the user's name in the search field . To filter by role, select the Roles drop-down menu . The filter will also display the number of users in each type of role (e.g. student). You can also add a user to the course . The People page also organizes all your student groups, where you can manage student groups. You can create groups to put students together to complete projects or other activities. Students can set up their own groups, which will allow them to work collaboratively. To manage course-level user options, click the global Options drop-down menu. You can view user groups . User groups are the same as displayed in the global settings at the top of the page. You can view prior enrollments in the course . Prior enrollments are students who were previously enrolled in the course and their enrollments have been concluded. You can also view a summary of all student interactions in your course . 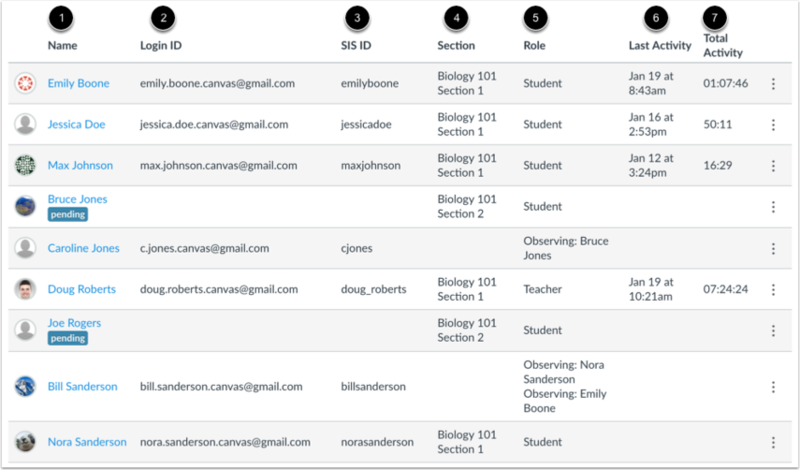 Interactions are recorded when you contact the student via Conversations or when you leave a comment on an assignment. You can view registered services for each user in the course . 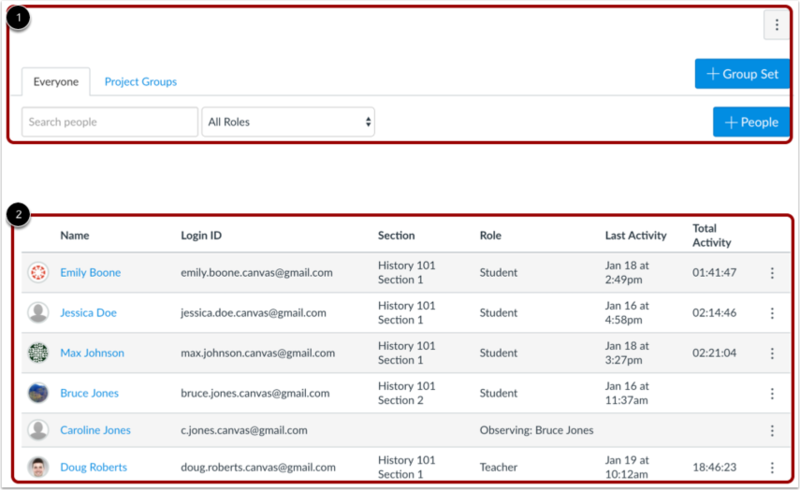 If a person has registered a social media account in Canvas, you can see that service listed and communicate with that person through any social media site they have registered. Last Activity —displays the date and time of a user's most recent interaction in the course. This time stamp updates when a user navigates through the course using the Course Navigation menu, replies to a discussion or submits an assignment or quiz, and when they access course files and pages. Please note that Last Activity does not include mobile interactions or group participation. 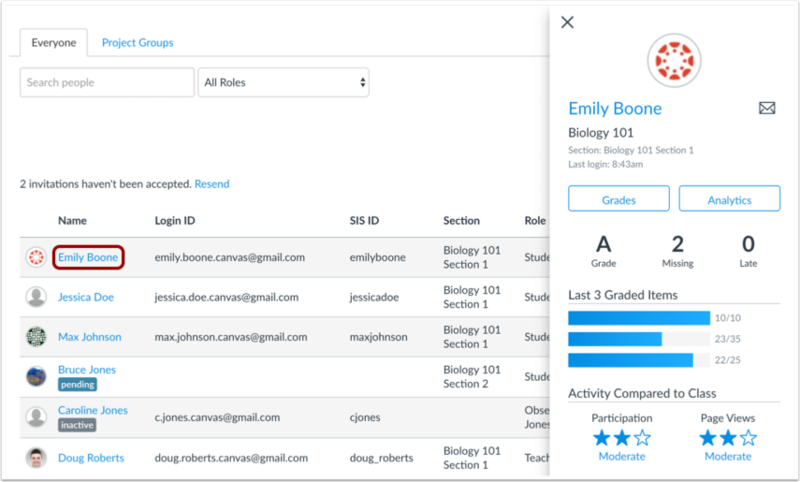 Total Activity —allows you to see how long students interact within a course and counts page navigation only. Total activity time is displayed in hours:minutes:seconds. If a user has not yet reached an hour of activity, total activity time is displayed as minutes:seconds. Total Activity records any time spent viewing course content that exceeds two minutes. If the time between a new activity and the last completed activity is under ten minutes, all time between these two events will also be included. Total Activity does not include group activity or page views for videos that do not include intermediate page requests, such as a half-hour recorded lecture. To view specific page views for a student, view the student's course access report. Note: Viewing user details, including Login IDs and user email addresses, are course permissions. Depending on your permissions, you may not be able to view all available information in the People page. You can also view the status for pending and inactive enrollments. Once a course is published, users receive an invitation to the course. Users who have not yet accepted the course invitation display a pending status . To resend course invitations for pending users, click the Resend link  at the top of the page. Users who are inactive in the course display an inactive status . 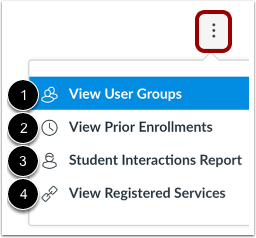 The inactive status allows you to view a user's prior activity in the course but does not allow the student to access the course. If your institution has enabled student context cards, you can view the context card for a student by clicking the student's name. Note: If this feature is not available, your institution has not enabled student context cards. To manage a user in your course, click the Options icon. You can resend course invitations and view user details. If you have permission in your course, you may also be able to edit the user's course sections, edit the user's role, deactivate the user, or remove the user from the course. For Observer roles, you can also link an observer to a student. Previous Topic:How do I view the history of a page in a course? Next Topic:How do I view a context card for a student in a course? 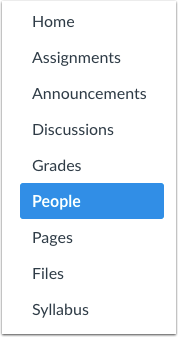 Table of Contents > People > How do I use the People page in a course as an instructor? Re: No students in course? Re: What are the steps to Cross-list 2 Courses and have the ability to add/drop students from the correct course after the term starts?